On November 7th I finalized all preparation for my big trip, packed Heloise (our blue Mazda 3), hugged Erma Turnip the cat, kissed my husband good bye (he was about to embark on an adventure of his own, a blog post about this is coming soon.) and left at around 10:30 AM to drive by myself to Zea Mays Printmaking Studios in Florence, Massachusetts. The round trip with various stops before and after the residency took me a total of 2764 km, through 6 different states/provinces in 20 days, of which 14 were spent making art. I should say that driving anywhere over 4h in a row is a real challenge for me. On the way to Zea Mays I made two over night stops to keep the driving time per day to a minimum and make sure I can primarily drive during daylight hours. 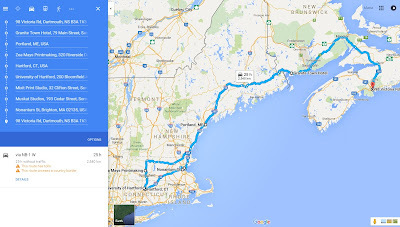 On my return trip I drove from Boston, Massachusetts to Dartmouth, Nova Scotia in 13h straight. 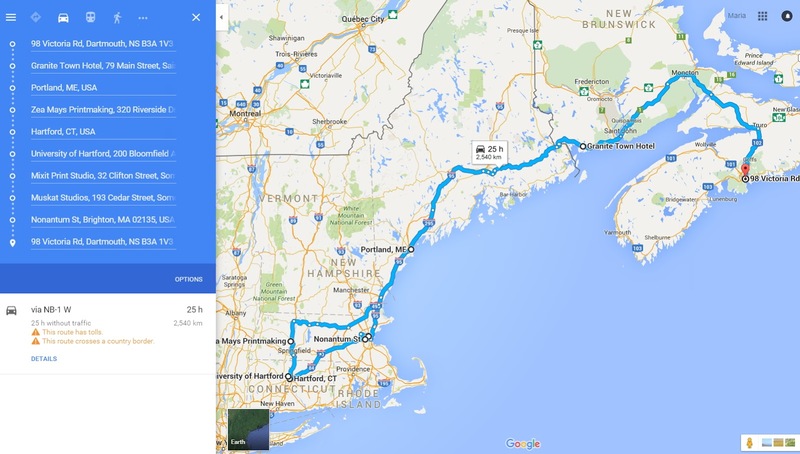 In this post I am going to talk about the first part of my trip from Dartmouth,NS to Florence, Massachusetts, stay tuned for adventures from Hartford and Boston and of course Scott, Brett and Georgina's grand trip across Canada. Finally on the road! I had been hoping and waiting for this trip for nearly half a year. The first day I made it to St. George, NB which is actually only about 20 minutes or so from the U.S. border. I stayed at the Granite Town Hotel, which was affordable, clean and friendly. The room was comfortable and for breakfast I could even find a few things to eat from their buffet. Overall it was a wonderfully quiet way to spend the night. The next morning I set my driving goal to Portland, Maine, to spend a lovely day and night with my graduate school friend Erin Smith of Wheatberry Design . During the drive to Portland the only significant thing that happened was that somewhere near Bangor, Maine some crazy driver passed Heloise and a truck in front of me by speeding down the shoulder of the road I was driving on. After safely making it to Portland, Erin and her partner Wes Covey (a very talented musician) welcomed me into their home and gave me a very enjoyable tour of downtown Portland. One of the first stops on our tour was Rich Entel's Cardboard Menagerie at the Maine Jewish Museum. Stunning animal heads made of cardboard, found materials and pieces of musical instruments. When I found out there was a gelateria in Portland that made dairy free sorbetto I couldn't resist. We had to stop at Gelato Fiasco and I had this super dark chocolate and the black currant sorbetto. Heavenly combination as you can see I am about to float a foot in the air. Erin made an amazing dinner and we spent the evening having great conversation. The next day before I continued on my trip, Erin and I spent a peaceful morning at the Dobra Tea house in Portland. What an inspiring place! Beautifully decorated and I got to experience a tea ceremony. I love their tea display, allowing visitors to see and smell the different kinds of tea. At around noon I said goodbye to Erin and Portland and headed to Zea Mays Printmaking Studios. I arrived at 4 pm and the lovely Sheldon Carroll greeted me at the door with a big welcoming smile. Sheldon is the artist residency program coordinator and husband of Liz Chaflin, the founder of Zea Mays. During my stay I came across this profile of the wonderful Sheldon in one of the local newspapers. He has a wonderfully sunny personality and brightens the room anytime he enters. It took me about a day to settle in, set up the annex studio space the way it works best for me, collect various materials, unpack and get acclimated. I arrived Monday late afternoon, spent all of Tuesday settling in and started printing and proofing full force on Wednesday. I had brought 15 different linocuts of which I at the very least wanted to pull a satisfactory proof of every single one, and hopefully edition many of them. I brought, rag paper, eastern paper, and much fabric all cut and ready to go. The glass table in the studio would quite frequently seem too small because I was experimenting with so many different inks at the same time. Clean up would take at least an hour and a half at the end of the night. On the first day I filled up this metal barn door with a wall of fabric proofs. Magnets came in handy. By the second day of printing I decided to edition the small 6 inch linocuts. So I experimented with various spot rolling combinations until I found which I preferred for each individual image, those I then editioned on delicate eastern paper. During my stay at Zea Mays, this tiny roller became my favorite. I need to get my hands on one of these. It's barely a sliver of a roller, and it comes completely apart for easy cleaning. I mixed inks twice during my stay then packaged them and pinned them to this board for inspiration and easy access. After finishing the editioning of the smallest blocks I moved one step up and decided to do a 2 block print of one of the 1 foot linocuts. I had previously transferred the image to the second block and was able to jump right into editioning this one. But instead of printing a straight up edition I printed 5 different editions, each on different paper with a different color palette. Because? Why not? Here a little video of carving the second layer reduction. Layer two on one of the editions. I really like the way this image looks even though it's just the excess ink that squished out the back of the super thin eastern paper I was printing on. I love the ghostly and layered effect of it. Third and Forth Layer (below). There are prints of 4 of the 5 editions - in - progress pinned to the wall in this photo. On many of the prints this was the 5th layer, on some it was the 4th. All of these layers where carved reductively from one block. Once they are all dry I will drop the key image layer on top of them all and it will change everything. I love seeing the prints hang up in space and light to shine through like stained glass. Dropping the 5th layer onto the prints with the green base colour. To take a break from all that hard work I met up with the man who taught me lithography in his studio. Fred Wessel works primarily in egg tempera these days, but he used to have his own lithography studio set up in this space. Three of his stunning new pieces. This painting is Cassiopeia from his Constellation series. And of course my quick photograph of his pieces do not due the detail and goldleaf justice at all, so make sure you check out his website! Of course we needed to take a selfie together! What a pleasure it was to spend some time with you Fred! Thank you! One evening I explored Northampton a bit and stumbled across the Eric Wert Exhibition at William Baczek Fine Art in Northhampton. His pieces are vibrant, lucious, almost unreal in their colour intensity, at first glance you think..Oh it's a bowl of fruit, very traditional... and then you realize there is juice dripping all over the bowl, or that this tomato is actually mangled and squished and beautifully gross. It's difficult to put in words. But his work is very intense and very inspiring, and has to be viewed in person!! Liz stopped into the studio every once in a while to see how I was doing, and she snapped these two photos of me working away. As you can see, the little prints were too wet to continue printing on them so I bravely started printing the four 3ft blocks. I pulled a proof of all 4 of them right away. I am especially happy how this print turned out! On Wednesday, November 18th, I gave an artist talk in the Printmaking Studios at UMass Amherst, which was lovely! Thank you Mikael Petraccia for giving me the opportunity and inviting me to meet the students! We had to string extra lines across the room because I was running out of space to hang the prints very quickly. On Friday November 20th I had an open studio event in the annex inviting anyone who wanted to see and ask questions to stop in. It was great! Thank you Liz and Sheldon for making it possible. It also gave me an opportunity to talk a bit about this body of work, which I had never done before since it's all new. It was very helpful to figure out what it's all about. This is pretty much how far I got before I had to take it all down, pack it up and say my farewell at Zea Mays. I haven't really had the time yet to fully process the adventure. But I think it couldn't have possibly be more productive. I pretty much printed and proofed an entire body of work. It would be amazing to see where this could go from here if I had another 2 weeks consecutively in the studio. But either way I am thrilled about the work. I am thrilled about my experience at Zea Mays. I felt incredibly welcomed and respected. Thank you Liz and Sheldon for making it possible! Thank you to all the members at Zea Mays who chatted with me and showed interest in what I was doing when I felt a bit lonely in the annex.